whale watching opportunity. Okay I did not exactly see the whole gray, but plenty of spouts – (The State Park ranger counted 14 whales passed by on their way to Baja California and Mexico) Yes, it’s migration season. #1. 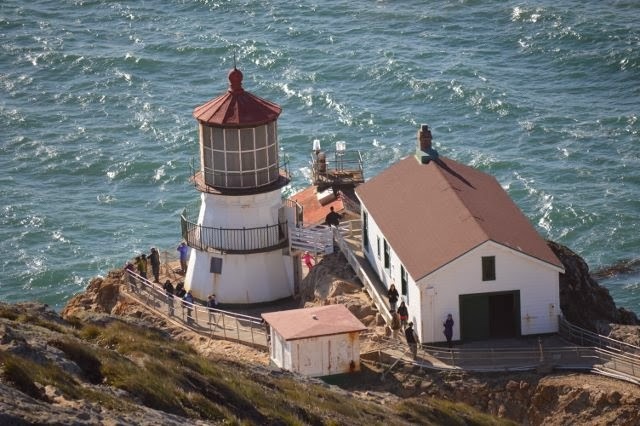 The Point Reyes Lighthouse can be found at the bottom of the hill. If you dare to take a strenuous descent and ascent of very narrow 308 stairs, you'll be rewarded with more amazing views; you'll be able to admire the famous lens (click on the link below for additional info) and be entertained by the internal workings of the light and foghorn.